She's really cute when she smiles. @endeavor. I think the young hero is Joo Won. Just like the description said. Somewhere in this thread, someone said that while Mok Dan was running away from Kang-to, she jumps down the window right, and then she got captured. They then zoomed in to Kang-to's face and then zoomed in to the knife behind him, hanging by the wall. Following my intuition, I think that was a clue saying that Kang-to is definitely the younger hero who have saved her. It's like one of those scene in Kdrama, where there are two lovers looking for each other, they walk on the same street but for some STRANGE reason, they NEVER EVER notice each other .__.. Like suddenly a phone call and one of them turns back and the other enter some store, and missed the chance. You know those kind? lol. Well, I think the knife's situation is like that too. Otherwise they would of film a hint scene of the knife with Kang-san. I guess we'll see (maybe) with these two up coming episodes to see if that's correct. 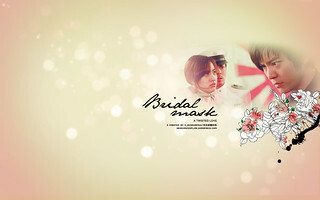 I made some wallpapers for bridal mask while waiting for tonight's episode. Available in 2 different sizes, 1440x900 and 1280x800. Todays episode was good but it showed us again wat an A## Kangtoh is. He really beat the crap out of the citizens. So sad. And I dont like it when they show us previews which contain spoiler for episodes which are not yet shown. I mean we were supposed to see in todays episode Kangtoh and his friend having a row but we didnt see it, and the part where he confronts MokDan wasnt shown either. Mokdan really hates Kangtoh, I knew that but in todays episode it is shown how much she hates him. I want moreee KT and MD scenes! Well he's not simply a jerk, he's much worse that a mere jerk...Today episode was so very dark and it made me dislike Kang To even more. The writer needs to come up with a brilliant script for the next episodes so that we can believe that this bad-to-good transformation is believable. It was very hard to watch how Kang To beat up his own brother. Anyway, can't wait for more. Kang To reminded me today Anakin Skywalker from Star Wars: Episode III. And especially when he dressed in black. Reading from the comments here, I think that the drama does gives a different vibe than the rest, you know? Like the hero doesn't ALWAYS have to be good. Kang-to is an example. It shows that he's just human like the rest of us and falls into despair and makes his way through life, not knowing the truth. That's why he's reckless, it's more realistic that way, rather than suddenly a person becomes "good." Maybe if he's "bad" now, he will eventually develops his "good" character. Knowing that being a government official and having money isn't always a good thing. Maybe there's more important things in life that he can pursue. I.E. being "Bridal Mask." :]. But I never thought he will beat his own brother, not out of ALL people.......... i mean seriously... his brother? I thought he sided with the Japanese because he wanted to earn money to TREAT his brother, Kangsan...???? Okay, I don't wanna get too agitated now.. I'll see for my own later. 바칠 수 있다고 슌지 앞에서 위악을 떨어 댄다. ※ 예고 영상은 준비 중 입니다. 이 점 양해바랍니다. 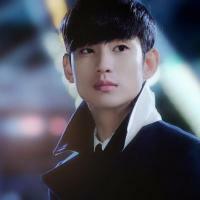 I think that when Kang To initially becomes Gaksital, he won't do it because he loves the Korean (Joseon) people. It will be more to avenging his brother and perhaps, protecting Mok Dan. I actually like Kang To being bad richard simmons. Everything Kang-To does is for a reason and his life and his family's is in danger. They are trying to kill him. I am devastated he had to hurt his brother to keep his identity secret but when his brother dies. He will avenge him by destroying those who keep harming his family. I already can see how he will fall for D and become the Hero instead of the villain.Sigh this drama is so god I cannot watch it live because I go stir crazy. When Kangto finds out that Mokdan was the ‘Boonie’ he thought was dead from his childhood, he feels very tormented that he acts evil and tells Shunji that if he catches Gaksital he will offer vegetables as sacrifices towards that girl. Kangto starts getting suspicious about the origins of Gaksital and discovers his brother Kangsan hiding his bloodsoaked clothes…. This drama has my name written all over it! I am in for the count! It is shaping up to be everything that I wanted City Hunter to be which it unfortunately wasn't. (imo ymmv) If the production can keep it up this has potential to be truly EPIC! I am a fan of City Hunter and I was really addicted to it, for me it had all the aspects I expect from an engaging drama, however, I think the pace and story slowed down considerably after episode 12 and there was no development in the relationship between Yoon Sung and Nana after that plus the rushed and improvised ending due to the floods in South Korea. Actually, BM reminds me of CH like it's a younger brother but much more darker mood and with an antihero. Personally, I look foward to the interactions between Kang To and Mok Dan. From the few scenes they were in together I can sense a simmering chemistry under the surface of their facades. I was pleasently suprised by the actress that is playing Mok Dan she is really natural completely lacking those stilted and affected expressions that many Korean actresses seem to adopt and I really think this is why I find their chemistry so appealing because they both display raw emotions without any theatrical expressions. Nevertheless by the way the story is going right now it will take a very strong script to make Kang To's transformation and their developing feelings believable. Sincerely I hope they will end romantically involved together and then have moments heavily charged with pure and not so pure emotions .